These schools teach creationism, racism and sexism. They’re also taking your tax dollars. Ashley Bishop didn't find out until after she graduated from Christian schools that she was unprepared for a wider world of education. The textbooks used at all of Bishop’s schools were published by three of the most popular, and most ideologically extreme, Christian textbook companies: Abeka, Bob Jones University Press and Accelerated Christian Education. The ideas in these textbooks often flout widely accepted science and historical fact. 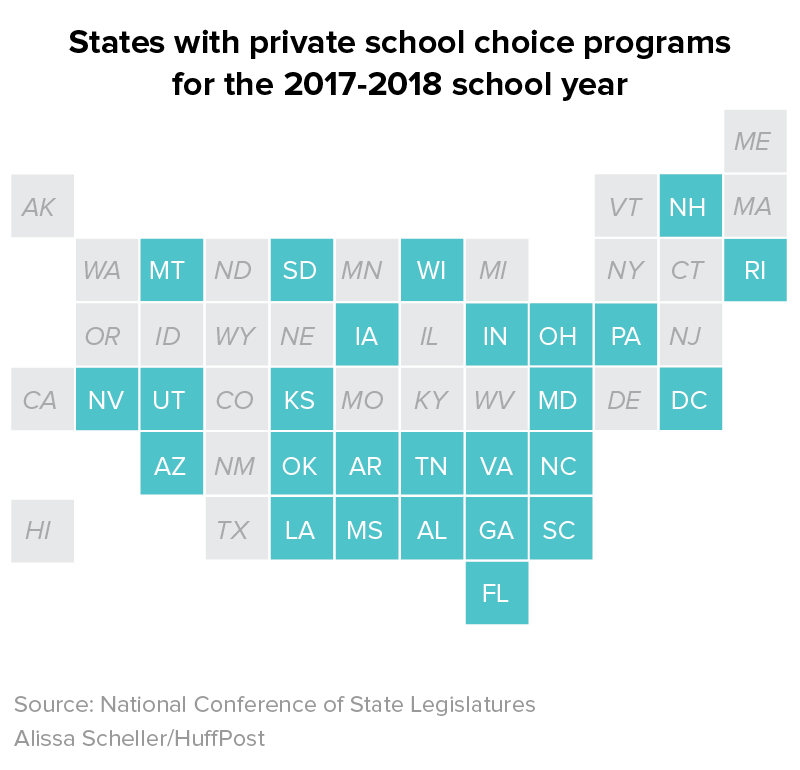 HuffPost obtained lists of schools that participate in private school choice programs around the country. We searched for the most up-to-date lists on either a state’s education or revenue department’s website. Then we researched the religious affiliations of each school by scouring each school’s website. If a school did not maintain a website, we emailed school representatives and often followed up with a phone call. 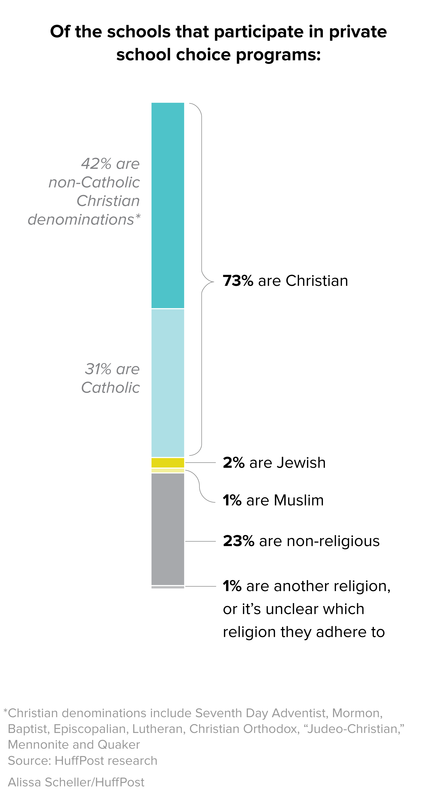 Our analysis found that about 75 percent of voucher schools across the country are religious ― usually Christian or Catholic, with about 2 percent identifying as Jewish and 1 percent identifying as Muslim. There were gray areas: At least five schools identified as non-religious but used a curriculum created by the founder of the Church of Scientology, L. Ron Hubbard. We did not assess Catholic schools, which made up 31 percent of Christian schools, since there is already a large body of research on the outcomes of students who go to these schools. Evangelical Christian schools are newer ― many popped up only a few decades ago – and remain less scrutinized. Indeed, we found many of the non-Catholic Christian schools (33 percent) were using Abeka, Bob Jones or ACE textbooks in at least one subject or grade. We found that Abeka was the most popular textbook source ― used in about 27 percent of non-Catholic Christian schools ― and Accelerated Christian Education was the least popular ― used in about 5 percent of these schools. We could not definitively ascertain the curriculum used by about 1,800 Christian schools, because they did not respond to requests for information. Around 200 Christian schools told us they did not use these three textbook sources. Secretary of Education Betsy DeVos has pushed for a federal school voucher program and tax funding of religious schools. “When it comes to hateful ideology and rhetoric, I was taught a lot of things to skew my mind into believing ― I guess you could call it brainwashing,” said Balzak, 27, who is using a pseudonym to protect the identity of family members who are still deeply involved in their church. The school participates in Florida’s three private-school choice programs and currently enrolls 172 students on these scholarships. It received $554,418 in taxpayer-funded scholarships this year, according to a spokesperson for the Florida Department of Education. “It’s a very different education I’m sure than 20 years ago,” said head of school Joseph Sanelli. But in some ways, Balzak considered herself lucky. She said her childhood wasn’t traumatic, just deeply imperfect. Bishop didn’t have such luck. The school consisted of three rooms, Bishop recalled, with most of the school’s 30-something kids spending all day in the same classroom. The school relied on an Accelerated Christian Education curriculum currently used by at least nine private schools in Georgia that are eligible for taxpayer funds. The average student who works on 6 subjects of the core A.C.E. curriculum completes about 72 PACEs per year. Therefore, students memorize at least 72 Bible verses, plus 9 major portions of Scripture each year! A 2012 training manual for administrators obtained by HuffPost lists an education degree as a “detriment” for the job. Indeed these supervisors’ lack of qualifications was once the topic of a “Judge Judy” episode about a decade ago. At Bishop’s school, she dealt with intense physical bullying and verbal harassment. When she would complain about the harassment, school authorities told her to ignore it. They sometimes implied she was at fault and needed to get closer to Jesus, she said. The school did not employ professionals trained to deal with mental health issues, she added. Balzak echoes these sentiments, saying that even her female teachers reinforced the idea that women are secondary to men. When describing the 1920s, a high school ACE textbook criticizes women for wearing short skirts and cutting their hair, calling it a violation of Scripture. Before the 1920s, when women were less likely to work outside the home, they “were comfortable to be discreet, chaste, keepers at house, good, obedient to their own husbands,” says the material. Roxboro currently participates in North Carolina’s voucher program, and representatives there confirmed that Bishop was once enrolled. The school also confirmed that they use Abeka, Bob Jones and ACE. Roxboro has received over $8,000 this year in voucher program and currently enrolls four scholarship recipients, per a report from the North Carolina State Education Assistance Authority. Neuse Christian Academy uses materials from Abeka and Bob Jones University, and it received $37,368 in scholarship money for 18 students, per the North Carolina Education Assistance Authority. The school was not able to confirm Bishop’s enrollment because it does not still have its records from that time. Abeka, Bob Jones University Press and Accelerated Christian Education started selling textbooks in the early 1970s, a few decades before Wisconsin enacted the nation’s first voucher program. At the time, enrollment in fundamentalist Christian schools was booming. For one, recent Supreme Court decisions had banned school Bible readings and official school prayer. Groups of evangelical Protestants were alarmed. The founders of these textbook companies dedicated their lives to pushing fundamentalist viewpoints. Abeka leaders Arlin and Beka Horton also founded Pensacola Christian College in Florida, which outlaws dancing and other “satanic practices.” They also founded Pensacola Christian Academy, a K-12 school that currently receives public funding for student scholarships via Florida’s tax credit program. Bob Jones University Press is affiliated with Bob Jones University, which famously lost its tax-exempt status in 1983 after banning interracial dating, a policy it didn’t reverse until 2000. ACE, Abeka and Bob Jones University Press leaders have largely similar educational philosophies, with a few subtle differences. The leaders of all three companies subscribe to an authoritarian vision of education in which students are taught not to question their elders. While ACE’s curriculum barely involves a teacher, Abeka’s promotes the educator as an absolute authority, per research from Binghamton University professor Adam Laats. They all have come under fire for providing children with an inadequate education. Ashley Bishop says the evangelical Christian schools' curricula kept her from going in directions she might have been interested in. “Our material is not written with conventional viewpoints in mind. We do not believe that education should be nondirective or speculative, or that the final interpretation of facts and events should be left up to immature inexperienced minds as mainline secular curricula do,” wrote a former ACE vice president at the time. “We recognize that academic scholars have differing opinions on historical/scientific content and that this frequently occurs in both public and private educational institutions as reported in the media. We are confident that our content is accurate, age appropriate, and academically rigorous,” wrote Brent Phillips, assistant to the president for business affairs, via email. Educators who use or are familiar with these resources told HuffPost that not all schools who use them have a fundamentalist approach. Indeed, not all schools who use these curricula are deeply religious, and they are used in a range of Christian schools. They emphasize that the quality of these publishers’ resources differ based on subject and grade level. Bishop said that, while her “education did not equip me to get the most basic of jobs,” she praised the rigor of Abeka and Bob Jones vocabulary and reading comprehension lessons. Dave Moore, executive director of Pittsburgh Urban Christian School in Pennsylvania, said that he does not use any materials provided by these sources but that “Abeka has excellent elementary grammar resources.” Pittsburgh Urban Christian receives scholarship money through Pennsylvania’s school tax credit program. “I would still use it if we didn’t already develop our own curriculum. It does such a good job of it,” said Moore of Abeka’s elementary phonics and math resources. “We do the same thing with secular textbooks,” Moore said. “Abeka and Bob Jones and other biblically based curriculum try to approach academics from a biblical standpoint and from a moral, ethical view, which does not necessarily push any agenda outside of an understanding of God and who Christ is,” Lindahl said. HuffPost also reached out to multiple national school-choice advocacy groups for their responses on our findings. None of them responded, even sometimes with weeks’ notice. Kaeli Subberwal contributed to this report. Data and graphics by Alissa Scheller. Animation by Isabella Carapella. This is the first story in a HuffPost investigation on the policies and curriculum of schools that participate in private school choice programs. The second story, dealing with schools with strong ties to Scientology, is here. The third story, looking at schools that discriminate against LGBTQ students, is here. CORRECTION: A previous version of this story relied on data that overcounted the number of schools participating in private school choice in Florida. The total number of schools in our original analysis has therefore been updated to about 7,200; the previous count, reported as “nearly 8,000,” was about 7,900. Statistics based on this figure have been updated, but do not meaningfully change the results of the research. We will continue to update the downloadable data set for this story as more information about school participation becomes available.